Wheels: 105th Anniv. Wheels Chrome, Profile Laced Aluminum – Front 16 in. x 3 in. / Rear 16 in. x 3 in. Brakes: Caliper Type 4-piston front and 2-piston rear; Rotor Type (diameter x width): Patented, uniform expansion rotors – Front (floating) 11.50 in. x .20 in. – Rear 11.50 in. x .23 in. 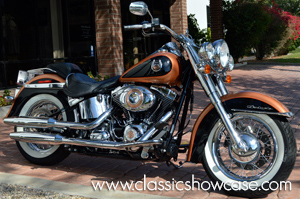 This one owner, special ordered, Heritage Softail Classic offers long-range touring comfort and nostalgic style with big front end, chrome passing lamps, and a brand-new battery. With the upgraded specialty chrome package worth $7,000, this is #325 out of 2,000 bikes made for the anniversary edition and comes with the limited-edition shimmering Anniversary Copper and Vivid Black paint, a seat with a copper-colored insert, a special copper air cleaner cover, plus exclusive badging. This Harley is just like it left the showroom with only 1,907 original miles on the odometer. It’s not often you find a bike this beautiful, and with such low original miles. It is ready to be ridden, enjoyed, and will be the center of attention on all your weekend rides. A smooth ride and comfortable position carry the Heritage Softail rider far beyond the horizon. A limited-edition 105th Anniversary package of was offered on 14 different 2008 Harley-Davidson models. Production of these motorcycles was limited and serialized. New on the Softail models in 2008: Top-Mounted Battery: The terminal attachment points have been relocated to the top of the battery for easier service access. Hollow Axles: New 25 mm hollow axles are assembled with new bearings, spacers and sleeves inside the wheel help stiffen the rear swingarm for a more stable feel on the road.